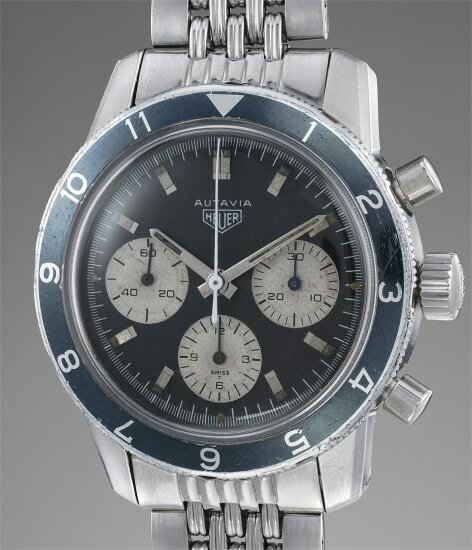 At first glance, one can see that the present Autavia, 2446C, is characterized by the 'compressor case', hence the "C" after the reference number. Introduced circa 1968, the compressor case was an alternative to screw down cases and insured waterproofness and robustness to the watch. The case became larger by 1mm than its predecessor, boasting 40mm case diameter. The present watch is also fitted with a bezel indicating only the hours. But what makes the present watch special and distinguishes it from its peers is the engraving on the caseback. This watch had a totally different destiny than the normal production as it was commissioned by the Argentinian Air Force for their pilots. Bearing the FAA, Fuerza Aerea Argentina emblem along with the issued number 0823, the watch was on duty in the early 1970s. Jack Heuer designed the Autavia as the perfect chronograph for racing, using a strong contrasting color scheme on the dial to improve readability in precarious situations. This contrast between the color of the dial and the one of the subdials also made it a suitable watch to be used by Air Forces around the world. Despite its tumultuous life, this watch remains in very good condition and is still fitted with its original Gay Frères bracelet stamped 1.70.